What is the value of increasing your flight capabilities? For Hawker 800 series, winglets allow you to fly non-stop across the US, or comfortably reach Jeddah from Paris. You can also complete shorter missions with greater payload and fuel reserves... without buying a new aircraft. Residual value, perceived value and fuel savings are important factors to consider when calculating the return on investment for a winglet modification. Winglets are quickly becoming a standard. As the number of winglet-equipped aircraft on the resale market increases, Gary speculates it will become increasingly difficult to sell an in-service aircraft with conventional wingtips. Additional value is realized through improved fuel burn. For example, operators who regularly fly longer missions (coast-to-coast or US-to-Europe, for example) can cut their fuel bills significantly. Operators can also fly faster for the same fuel burn, saving valuable time and lowering direct operating costs (DOCs) for their operation. The longer range, improved cruising speeds and fuel efficiency realized through a winglet modification is far more cost effective than upgrading to an aircraft with similar capabilities. For tips on managing the cost of a winglet installation, look for next week’s blended winglet blog post. 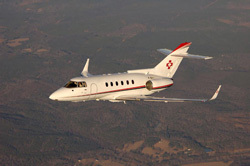 Find out more about Falcon 2000 series winglets and Hawker 800 series winglets at www.DuncanAviation.aero/airframe. Or contact a member of Duncan Aviation’s Falcon or Hawker Airframe Service Sales team for information about our winglet installation capabilities.